Which BIG Star Was Just Seen on the "Fast & Furious 7" Set? He was rumored to be up for a role in "Fast & Furious 7," but now it's official: Kurt Russell is on the set! The cast is currently filming the next installment of the action franchise, which keeps getting more and more successful with the release of each movie. 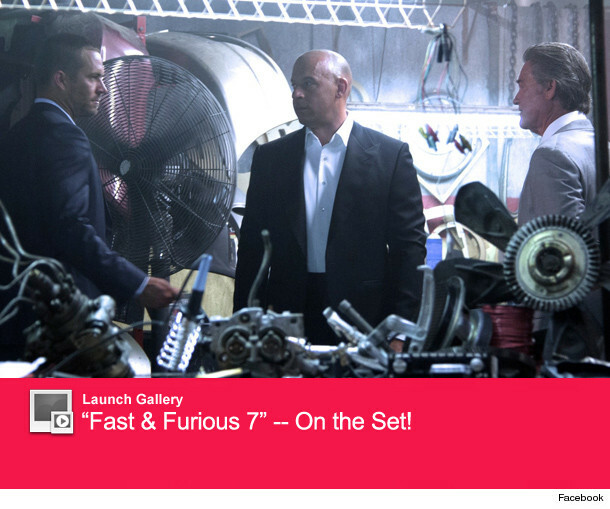 And yesterday, Vin Diesel confirmed Kurt's involvement -- posting a photo on Facebook of the legendary action star doing a scene with Vin and Paul Walker. So far we don't have any details on Russell's role in the film, which finds the gang facing off against Jason Statham. Statham plays a bad guy who, SPOILER ALERT, killed Han (Sung Kang) at the end of "Fast & Furious 6." Ludacris, Tyrese and director James Wan ("The Conjuring") have all shared photos from the set as well -- including one from what is believed to be Han's funeral. See those pics above! Luda also posted a video with returning star Michelle Rodriguez. "Tokyo Drift" star Lucas Black ﻿will also return to the franchise after being MIA from the rest of the series. FYI: Even though it was the 3rd movie to be made, 'Drift" actually takes place after the events of 4, 5 and 6. Confusing, right? "Fast 7" is due in theaters July 11, 2014. Photos: Vin Diesel Celebrates Star on Walk of Fame with Family!